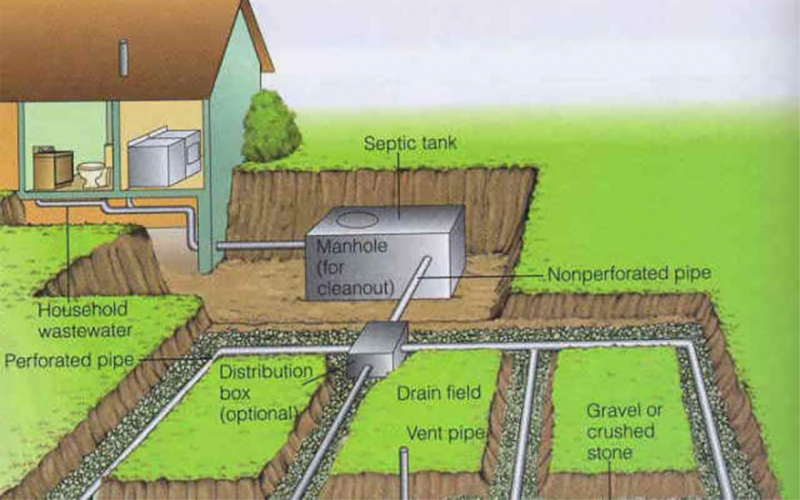 A septic tank is a small-scale domestic sewage system common in areas with no connection to mains sewerage. They work by receiving waste water from the property, separating the solids from the liquids, storing and decomposing the solids whilst allowing the waste liquid out to a soakaway or drainage field where it drains into the ground through perforated pipes. Solids that do not decompose remain in the tank. If the solids are not removed by regular emptying, they will accumulate and eventually overflow into the soakaway, which can cause extensive damage in the form of silting up and decreasing its capacity until it can’t outlet and starts backing up. This system works using gravity, the soakaway must be below the level of the septic tank. Also, the bottom of the soakaway must be above the water table. The soil above the water table is used to treat the wastewater before it returns to the environment. This system has a pump that pumps the wastewater to the soakaway. This is required when the area of the soakaway must be at a level which is above the outlet of the septic tank. This can be due to space available, levels that dictate or ground conditions. Septic tank maintenance is often compared to vehicle maintenance because only a little effort on a regular basis can save a lot of money and significantly prolong the life of your system. Yearly emptying and inspections of your septic tank ensures that it is working properly and is kept in a good condition. This saves you from the inconvenience and high costs of blocked pipes, backing up tanks and failed soakaways.